APPPALACHIAN ARTIST CRUSH is a series of interviews with artists from around the East Tennessee region, whose work I admire and who I want to share with the world. Ren is a bodypainter and make-up artist. Her work is full of vivid color, texture, and pattern, and her canvas is human skin. By nature of her medium, her work is both collaborative and evocative. My mum was a big believer in surrounding children with art and art supplies, music and books. So we always had the ability to create from an early age. Some of my earliest memories are coloring books of course, and playdoh. In the 1970's when I was growing up, Playdoh came in very basic colors. I remember taking the primaries and making color charts out of blending them in a variety of methods. My first experimentation with color theory. When I started drawing in Junior High, I was heavily encouraged. Art was a constant into High School with advanced placement class and Mum paying for watercolor classes outside of school. I still have the Rembrandt pastels she purchased for me, a luxury for the young artist. I think that as a child who felt a lack of control in life so often, art was a chance to shape my world. To make things look the way I wanted. The tactile experience of shaping things, or manipulating color was vastly rewarding to a child who craved hands-on experiences. Later, art and writing saved me more times than I can count. It varies depending on the medium of course, but I do find that the constant with all of my art is the desire to layer. I'm fascinated with the layering process and how you can create dimension and depth where there was none. Even with bodypainting, where form and dimension already exist before you put a drop of paint on your canvas. Sometimes my best work comes from a very intuitive and unstructured approach, other times a lot of planning and practice produce the best results. So it's a big "it depends". I love researching a topic, I adore themes and searching google images for inspiration. Ideas tend to lead to more ideas. Notebooks are kept nearby because my brain is constantly picking at some thread of connection or some desire to express. It makes sleep difficult at times, but the river of inspiration is never dry. Most of my processes are unique because it almost always involves other humans. 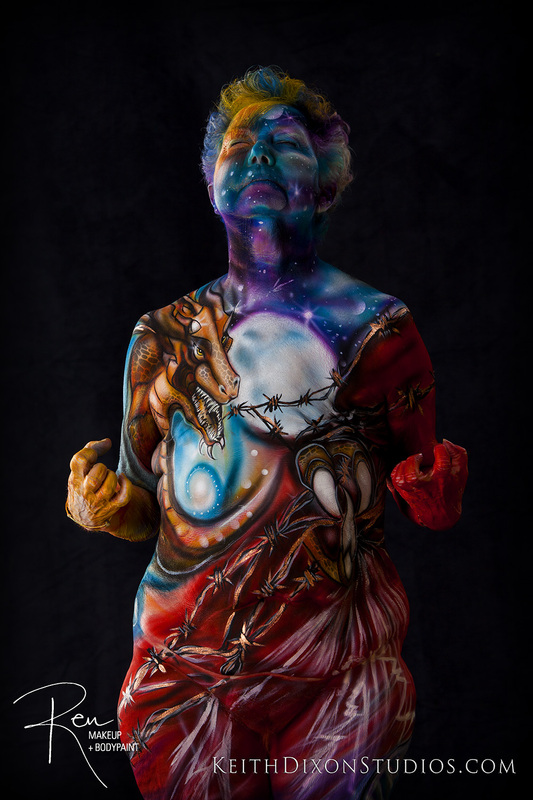 Bodypainting is always a collaboration, not only with the canvas but the photographer. That's one of the things I love most about it. The habit of doing. Just doing. It doesn't matter if you feel like it, or you're "inspired", action is the magic. Within action you find your inspiration. I know it isn't romantic or exciting to say "DO", but that's really the key. I'm always learning to apply that truth better, and within other disciplines. Working on applying that to writing and the rest of my art forms outside of bodypainting which so often takes the forefront because it's my passion. I look back over motherhood and raising children and realize that it was the enemy of my art career in many ways, and the beginning of it in others. Mostly because I did not prioritize time for art. At the time it was acceptable because I was so focused on my children and what they needed. Which isn't a bad thing...but I lost myself in there. It wasn't until they were older that I found my way back. I went through a divorce and rebuilding my life on my terms, which was a hurdle at first but also the fodder for creating exactly what I wanted. Sometimes the difficult times push you to fight for what your deepest self desires. Deconstruction is sometimes necessary for creative construction. Current hurdles have to do with making time for my own projects and not only doing client work. The studio is busy and I'm grateful, but I need time protected for personal projects as well. As far as I'm concerned, that's a great problem to have! I was that kid who hated school but loved learning. I spent so much time studying and learning things I was interested in outside of school. Art was my happy place, the classes I lived for. I got college credit through the advanced placement art program run by Princeton, but after high school I was burned out. I was a young mother and that took up all of my focus and energy. I'm ecstatic to be creating underwater bodypainting images on metastatic breast cancer survivors for the Serenity Project with my husband Keith. It's the biggest project we've worked on to date. Production begins in April of this year. Not only is this an art form I'm obsessed with, but shining a spotlight on metastatic breast cancer is hugely rewarding. Keith lost his former wife to metastatic and I lost my mother, so this project is deeply personal for both of us. The director of the project is living with metastatic breast cancer as well, so we all have a vested interest in sharing something spectacular with the world. An image from the Serenity project, featuring metastatic breast cancer survivors. The underwater bodypaintings have presented new challenges and results. I'm enjoying that process immensely and pushing to create better work constantly. The challenges within that art form are rather complex. When we get an amazing image it's hugely satisfying for that reason. You're not only dealing with materials that need to be waterproof, but safe on human skin. The photography portion is immensely challenging as well. I'm really proud of the results we are getting. Share your favorite local hangout & or another hidden gem. I love to go hide at Willow Tree Coffee House sometimes, where I can eat lunch and just decompress. The energy for artistic souls is wonderful. Other gems are Dos Gatos and Corner Cup. It's always the coffee houses where I can be part of the swirl of humanity on pause, where I find a desire to write or mull ideas around. Humans are my canvas, and they are also my stories and inspiration. There is so much to be said for human connections and the stories therein. Where can we find you on the interwebs? See all the Appalachian artist interviews here.